The Colville Reservation, located in North central Washington, is home to 9,353 tribal members. Residents live in the 1.4 million acres that are divided into tribally owned lands, individually owned trust lands, and non-tribally owned lands. The Colville Reservation is bordered on the East, South, and West sides by the Columbia and Okanogan rivers. As far as a physical description, the land is covered with mountains, range land, timberlands, lakes, and streams. The timberlands are mainly covered with ponderosa pine, lodge-pole pine, Douglas-fir, and western larch. Elevation on the reservation ranges from 790 feet above sea level to over 6,000 feet above sea level. The temperatures on the reservation range from an average summer high of 90 degrees Fahrenheit to a winter low of 10-20 degrees below 0 degrees Fahrenheit. An annual amount of 10-14 inches of precipitation on the reservation is common. Most of the communities on the reservation are connected via state maintained highways and the economy is mainly comprised of tourism, gaming and timber industries while the unemployment rate is 10.40% and per capita income is $17,846.00. Housing quality for elders, fixed income individuals, and low-income individuals is terribly inadequate and results in a definite and chronic need. 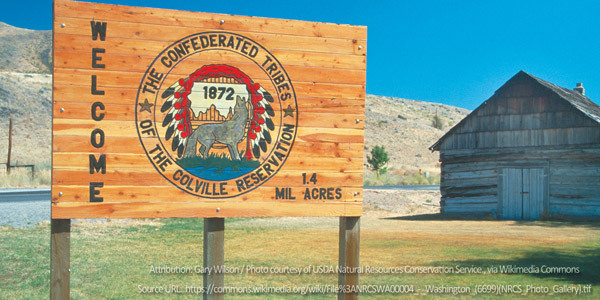 The Colville Confederate Tribe contains members of 12 tribal groups: Colville, Ivenatchee, Entiate, Chelan, Methow, Okanogan, Nespelem, San Poil, Lakes, Moses-Columbia, Palus, and Nez Perce. In February of 1938, the federal government approved Confederate Tribes' constitution and by laws which led to the establishment of the Colville Business Council. The Colville Business Council allows tribal members to elect 14 business council members to staggered 2-year terms. The council consists of a chairman, vice-chair, and a secretary elected to one-year terms. The members are salaried while in office.